Earth is in the outskirtsof a solar wind stream flowing from this sprawling northern coronal hole. Credit: SDO/AIA. Coronal holes are places in the sun's atmosphere where the magnetic field unfurls and allows solar wind to escape. In the image above, the sun's magnetic field is traced by white curving lines. Outside the coronal hole, those magnetic fields curve back on themselves, trapping solar wind inside their loops. Inside the coronal hole, no such trapping occurs. Solar wind plasma is free to fly away as indicted by the white arrows. 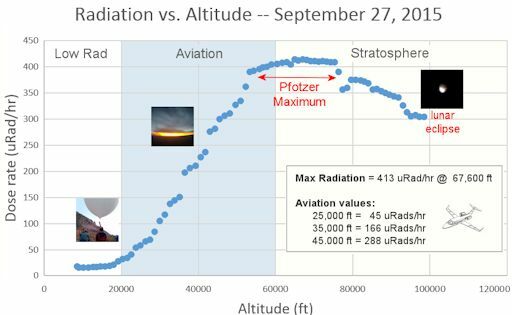 RADS ON A PLANE: Regular readers know that Spaceweather.com and the students of Earth to Sky Calculus regularly fly balloons to the stratosphere to measure cosmic rays. For the past six months, May through Oct. 2015, they have been taking their radiation sensors onboard commercial airplanes, too. The chart below summarizes their measurements on 18 different airplanes flying back and forth across the continental United States. 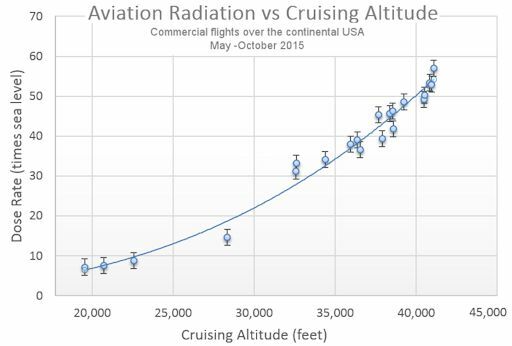 The points on the graph indicate the dose rate of cosmic rays inside the airplanes compared to sea level. For instance, the dose rate for flights that cruised at 40,000+ feet was more than 50x the dose rate on the ground below. No wonder the International Commission on Radiological Protection (ICRP) classifies pilots as occupational radiation workers. Cosmic rays come from deep space. They are high energy particles accelerated toward Earth by distant explosions such as supernovas and colliding neutron stars. Astronauts aren't the only ones who have to think about them; flyers do, too. Cosmic rays penetrate deep inside Earth's atmosphere where airplanes travel every day. This type of radiation is modulated by solar activity. 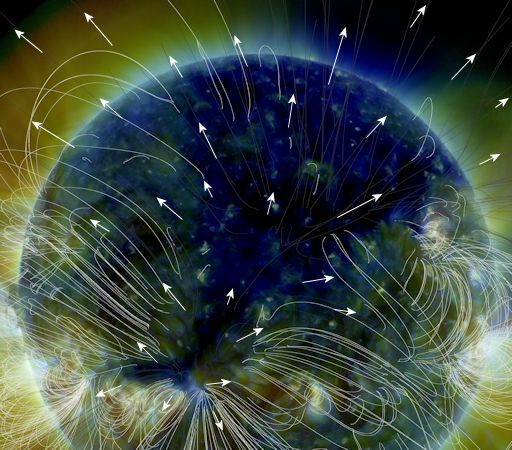 Solar storms and CMEs tend to sweep aside cosmic rays, making it more difficut for cosmic rays to reach Earth. Low solar activity, on the other hand, allows an extra dose of cosmic rays to reach our planet. This is important because forecasters expect solar activity to drop sharply in the years ahead as we approach a new Solar Minimum. 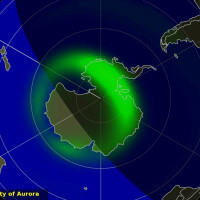 Cosmic rays are poised to increase accordingly. The plot, above, tells us what is "normal" in 2015. How will it change as the solar cycle wanes? Stay tuned for regular updates. 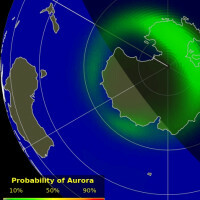 AFTER LAST WEEK'S "MASSIVE AURORAS," WHAT WILL THIS WEEK BRING? 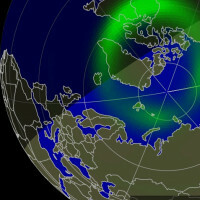 Arctic sky watchers are still buzzing about last week's 3-day outburst of Northern Lights. Many veteran observers ranked it as the brightest display they had seen in years. Photographer Ole Salomonsen was one of them. "On Friday, Oct. 9th, I was treated with perhaps the most massive aurora I have ever witnessed," he says. "They appeared right over my hometown, Tromsø, Norway." "The auroras were so strong that many of my shots were overexposed," he continues. "I had to continuously lower the exposure not to burn out the auroras. 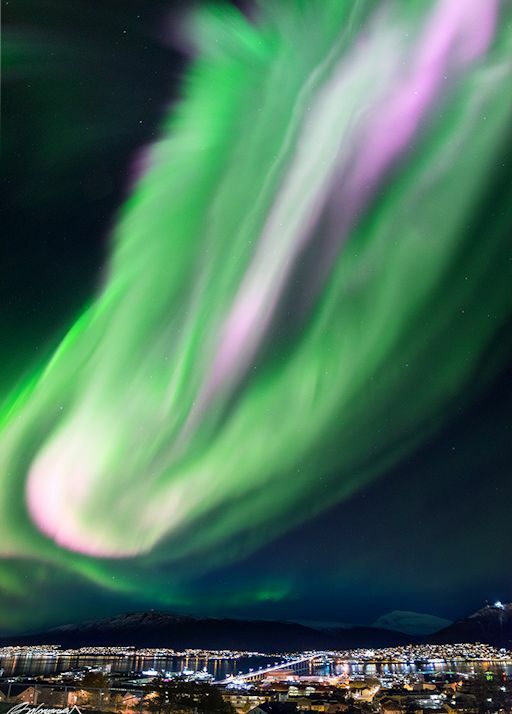 I have never in my life witnessed this amount of pink auroras, just MASSIVE!" The display was caused by shock waves from a CIR (co-rotating interaction region), which hit Earth on Oct. 7th, followed by a stream of high-speed solar wind on Oct. 8th and 9th. 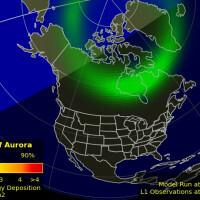 Strong geomagnetic storms sparked Northern Lights as far south as Virginia, USA. On Oct. 13, 2015, the network reported 53 fireballs. On October 13, 2015 there were potentially hazardous asteroids.